Late Phases sounds great on paper. Boldly proclaiming itself a champion of both practical effects and werewolves more interested in ripping out throats than in rippling pecs, the film comes with producer Larry Fessenden and makeup artist Robert Kurtzman—both well-respected genre veterans—attached. 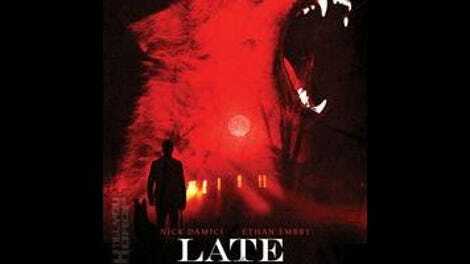 But thanks to a series of ill-advised decisions, beginning with its cheesy, guy-in-a-suit creature effects (which must have been intentional, given Kurtzman’s pedigree), Late Phases fails to deliver either shocks or real drama. Director Adrián García Bogliano does provide a few moments of bloody black comedy, like a shot of an iron lung squirting blood from the severed jugular of its decapitated inhabitant. But while Bogliano is good at disturbing tableaux, he’s uneven when it comes to working with actors, a handicap that becomes extremely obvious in this, his English-language debut. Character actors like Lance Guest, Ethan Embry, and Tina Louise are wasted in clunky, subtext-free performances. Tom Noonan, Robocop 2’s own Cain, is a notable exception as a sympathetic priest, and his relationship with Nick Damici’s skeptical hero provides one of the film’s more believable dynamics. But, like everyone else, Noonan and Damici seem to be fighting against the material, a script too enamored with clever flourishes (the guy’s blind, so he smells things! Like an animal!) to realize how on-the-nose its dialogue is. His face buried under 20 years’ worth of aging makeup, Damici carries the movie largely on his own, which wouldn’t be so bad if his character were developed beyond the fact that he’s blind, he’s a Vietnam vet, and he’s a grumpy jerk. 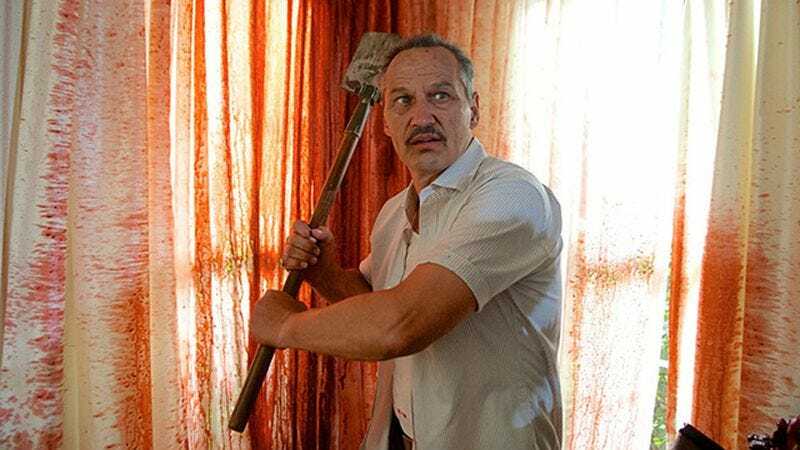 Viewers are supposed to sympathize with gruff, Brooklyn-accented Ambrose (Damici), who is being forced to move into a gated retirement community called Crescent Bay by his son Will (Embry). But the script makes that difficult by having him be unpleasant to everyone he meets, which isn’t necessarily a problem—there’s nothing wrong with an unsympathetic protagonist. The issue is that he’s unsympathetic and one-dimensional. The werewolf plot is revealed early on in the film, when Ambrose’s next-door neighbor and beloved guide dog, Shadow, are killed in a violent attack on the hero’s first night in Crescent Bay. (The local law enforcement’s blasé attitude towards the murder seems to suggest an intriguing conspiracy angle, but ends up being one of several ostensibly comedic plot points.) Turns out these attacks occur exactly once a month, and the majority of the film is spent following Ambrose as he tries to (literally) sniff out the monster among his bourgeois neighbors while waiting for the next full moon. But every development is so ploddingly obvious that what could have been slow-burn horror feels more like limp drama, and the final confrontation, when it does come, is satisfyingly gory but devoid of tension. So while Late Phases struggles valiantly—this film was obviously made on a very low budget—it’s too dreary to work as a fun old-school creature feature, and too ludicrous to work as a serious drama/horror hybrid.